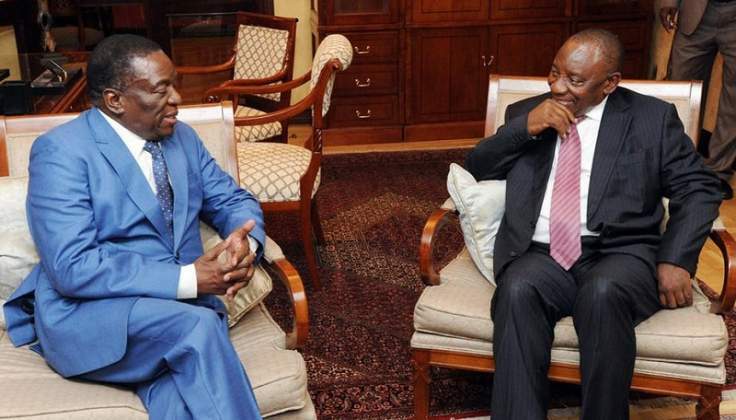 As the South African President jets in today those close to him yesterday said that Harare should not expect a bailout from its northern neighbour, which is facing a tricky election this year. The BNC's Heads of State Summit, which will be graced by President Emmerson Mnangagwa and his SA counterpart, takes place on Tuesday. Our Harare Bureau understands that six South African ministers - Lindiwe Sisulu (International Relations and Co-operation), Nosiviwe Mapisa Nqakula (Defence and Military Veterans), Rob Davis (Trade and Industry), Siyabonga Cwele (Home Affairs), Blade Nzimande (Transport) and Bogopane Zulu (Deputy Minister for Social Development) - will jet in today. Other ministers are, however, expected to travel to Harare with President Ramaphosa. Zimbabwe is South Africa's biggest trading partner. President Ramaphosa's spokesperson Ms Khusela Diko confirmed his itinerary yesterday and emphasised the extent of the economic relations between the two countries. "Trade co-operation between the two countries is at a high level to the extent that South African exports to Zimbabwe in 2018, amounted to approximately R30,8 billion (about US$2,1 billion), while imports from Zimbabwe amounted to approximately R3,6 billion (US$250 million), thus placing Zimbabwe among South Africa's top trading partners on the continent. South Africa and Zimbabwe have good bilateral political, economic and social relations underpinned by strong historical ties dating back from the years of the liberation struggle," she said. Several agreements covering political, economic, social and cultural relations will be signed this week. There are expectations the upgrade of Beitbridge Border Post and the revival of the National Railways of Zimbabwe (NRZ) will get fresh impetus through bilateral engagements between the two sister republics. Senior officials from the two countries concluded their two-day marathon discussions on Friday, paving the way for the ministerial session. During a meeting of senior officials from the two countries on Thursday, permanent secretary in the Ministry of Foreign and International Trade Ambassador James Manzou said the BNC would commit the two countries to urgently implement the 45 agreements that have been signed in the previous bilateral engagements. "The success of our co-operation will not be measured by the number of agreements we sign or the number of decisions that we take. It will be measured by the action we take and the concrete results that can be attributed to it. This means implementation of those agreements and decisions," he said.